A century ago, Eli Lilly and Company grew one of the nation’s largest cannabis farms to supply a variety of pharmaceuticals. Why does the drug maker seem determined to conceal the details of that history? Pfenninger became interested in marijuana legalization around 2010, when a professional friend of his was arrested for possession. He studied the history of the plant and came away with a newfound appreciation of its medicinal powers. Along the way, he became a passionate advocate for pot, and he posts to no fewer than 40 marijuana Facebook groups weekly. Several years ago, he had 17,500 black-and-yellow bumper stickers printed that read “MARIJUANA—Safer Than Alcohol.” He hands out buttons supporting a group he founded: Indiana Republicans Against Marijuana Prohibition. And while he claims he doesn’t smoke pot himself (“People automatically assume that,” he says), he’s playing an important role in exposing a surprising local connection to the drug that has been forgotten to history. Pfenninger—who owns 469 shares of company stock, worth more than $50,000—decided to submit a shareholder resolution in 2017 aimed at bringing that era of the company’s history to light. He also wanted the business to support descheduling cannabis as a prohibited drug. “I wanted to get Lilly to come out in favor of descheduling because I thought that might be helpful in getting legalization in Indiana,” he says. But Lilly wasn’t eager to revisit those years. When Pfenninger didn’t hear back about the resolution, he sent a fax to Lilly requesting an update, which the company claims to have never received. Last May, he tried again by email, and the business finally agreed to hear him out at its annual shareholder meeting. Pfenninger knew that convincing Lilly to detail the history of its marijuana farm was a long shot, but speaking on the subject would be an opportunity itself. Indy’s second-largest company seemed to be burying its own pioneering use of a plant that is now returning to medical-research labs across the country. “It’s as if history was rewritten,” he says. In 1850, the United States Pharmacopeia, the nation’s official drug-reference manual, listed cannabis as a legitimate treatment for a wide range of ailments. The United States Dispensatory, another reference book, advised doctors that it could serve as a medicine to “cause sleep, to allay spasm, to compose nervous disquietude, and to relieve pain.” It was a useful treatment for “gout, rheumatism, tetanus, hydrophobia, epidemic cholera, convulsions, chorea, hysteria, mental depression, delirium, tremens, insanity and uterine hemorrhage.” For decades, doctors prescribed it liberally. For the most part, patients were using a strain of cannabis shipped from India known as cannabis indica. In the late 1800s, pharmaceutical companies such as Parke-Davis—a forerunner of Pfizer—and Squib imported the plant, according to Reefer Madness, Larry Sloman’s history of marijuana. And as Pfenninger says, Lilly did, too, selling 23 cannabis-infused medicines. 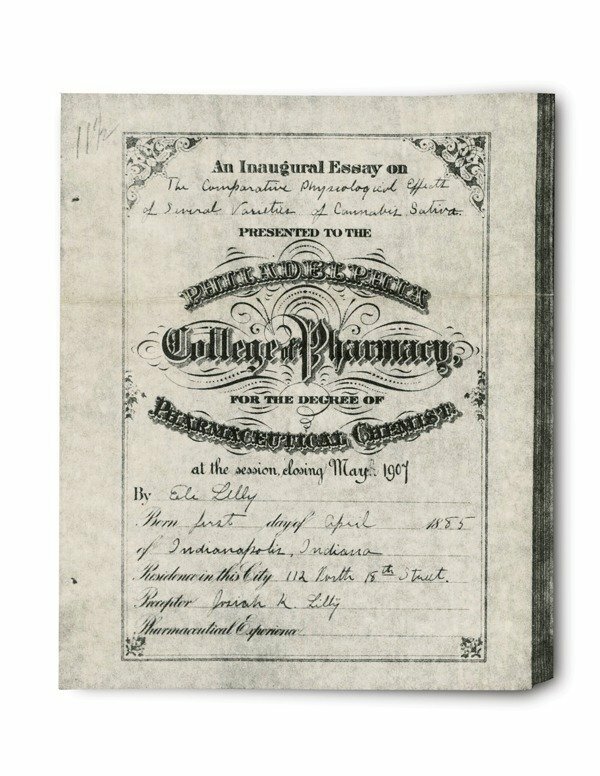 But scan the major histories of Lilly—James H. Madison’s Eli Lilly: A Life, 1885–1977 and E.J. Kahn’s All in a Century: The First 100 Years of Eli Lilly and Company—and you won’t find a single mention of the business’s exploits in selling marijuana-based medicine. “I don’t recall that at all,” admits Madison, one of the state’s foremost historians. J. Scott MacGregor, Lilly’s global communications director, declined to answer specific questions relating to this story. Although Lilly has vast archives, only scant evidence of those days remains outside the company’s headquarters. Antiques collectors have tinctures with the red-and-white Lilly label featuring cannabis sativa. But newspaper stories about those medicines and other accounts of them are scarce. Making matters even stranger, one of Lilly’s most celebrated executives clearly had an interest in the subject. In 1907, the Philadelphia College of Pharmacy (the nation’s first pharmacy school) approved a doctoral thesis titled The Comparative Physiological Effects of Several Varieties of Cannabis Sativa. It tested five different strains of American cannabis against cannabis indica, which at the time was much more powerful. The student was none other than Eli Lilly, the grandson of Col. Eli Lilly, who went on to become the company’s third CEO. Just as Lilly’s cannabis business ramped up, World War I closed naval shipping lanes and made importing the plant difficult. So in 1912, the corporation bought the farm in Greenfield. There, J.K. Lilly (the younger Eli’s brother and a president of the company himself) built a Spanish Mission–style building featuring stucco and red tile. Two years later, “Lilly Farms,” as the place was called, was up and running. The business figured out how to replicate the powerful Indian strain of marijuana. “Through advanced methods of seed selection and cultivation, Lilly Farms now produces cannabis of high potency, enabling us to offer a fluid extract equal to and identical with the therapeutic properties of the Indian cannabis,” according to Lilly’s January 1927 catalog A Complete Priced List of Products. For $6 per pint, you could get your hands on a tincture of cannabis sativa, a fifth of the price of cannabis indica, which retailed for $30. In the early 1900s, Lilly acquired what is now Conner Prairie, and went on to cultivate cannabis there as well, according to Don Wirtshafter, a marijuana historian and collector in Ohio. But in 1937, the Marijuana Tax Act, which placed a hefty tariff on the production of cannabis, made the operations money-losing propositions. Political headwinds generated during the Prohibition era might have changed Lilly’s approach to the drug. A newspaper article in The Times of Gary headlined “Evil Is Growing Among Mexicans” summed up the shift in public opinion: “The Marijuana, or hasheesh smoking evil among Mexicans and negroes of Indiana Harbor is growing to an alarming extent with little or no chance of police intervention. Many of the recent crimes committed there by these races are differently traceable to the effect of this insidious weed.” Soon, Indiana had the most prohibitive laws against marijuana in the nation. Long before the recent wave of medical marijuana legalization, Lilly was ahead of the curve as one of the world’s leading distributors of cannabis-based pharmaceuticals. But in 2019, they’d rather you not know it. All of which raises the question: Why? Eli Lilly’s 1907 thesis on marijuana’s medical potential was revolutionary at the time. One Monday last May, a Lilly staffer escorted Pfenninger to his seat inside the Lilly Center Auditorium. He was there for the annual shareholder meeting. On the agenda that day were 10 items of mostly commonplace business: the ratification of Ernst & Young as principal independent auditors for 2018; approving amendments to the board structure; electing corporate directors to three-year terms. Then there was Pfenninger’s agenda item: a “shareholder proposal seeking support for the rescheduling of cannabis.” Attached to the agenda was a 93-word supporting statement that Pfenninger crafted, recounting Lilly’s history in the cannabis business. “I don’t think they were happy to have me do that,” he says. Pfenninger had three minutes to make his pitch. He stuck mostly to the history of the operation, starting with Lilly’s 1907 thesis. “Lilly sold 23 different cannabis entries in its medical catalog in 1935 before the 1937 Marijuana Tax Act and Reefer Madness halted sales,” he told them. “Parke-Davis worked with Lilly to create its own strain, cannabis americana, which Lilly grew in Greenfield. Cannabis oil kills cancer, prevents and reverses dementia, prevents epileptic seizures, and extends longevity, among other things.” For most of the stockholders present, it was their first time ever hearing about the project. Even in defeat, Pfenninger seems content with his effort to expose Lilly’s cannabis past. He says the legalization movement is advancing so quickly now that he won’t try to bring the same proposal before the company’s leaders again. His plan to force Lilly into disclosing its past history with the drug to support descheduling it no longer seems necessary. Still, it puzzles him. After Lilly shuttered its marijuana operation in 1937, Lilly Farms became the headquarters of Elanco, an animal health spinoff company. The original 1912 stucco-and-red-tile structure that housed its laboratories still stands, and is now listed in the National Register of Historic Places in Hancock County. Nothing on the commemorative plaque mentions that it once was home to one of the world’s largest pot farms, creating medicines that treated the symptoms of hundreds of thousands of people. Much of that history, like the pharmaceutical company’s most confidential research, only Lilly knows.